Have you ever wanted to try something new and fun with your manicure without doing anything over the top? 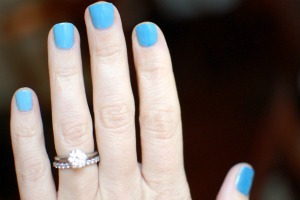 If you have, then the ombre manicure might just be the perfect look for you. Grab one of the gorgeous new polishes for spring and try your hand at this fun and easy-to-achieve manicure. Apply a base coat to your nails and allow it to dry. Apply the colour to your thumbs, straight from the bottle. Apply the white polish to your pinkies, straight from the bottle. Place one drop of white and three drops of colour on the aluminum foil. Mix thoroughly and apply to your index finger. Mix two drops of white and two drops of colour on the foil and apply to your middle finger. Mix three drops of white and one drop of colour and apply to your ring finger. When nails are completely dry, repeat steps 4 to 6. 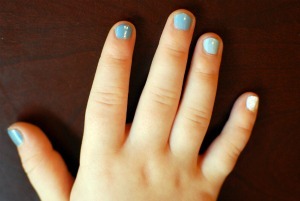 Allow your nails to dry completely, then add a top coat. Place seven drops of colour on aluminum foil. Add two drops of white, mix, and apply to your index finger. Apply two more drops of white, mix, and apply to your ring finger. Apply two final drops of white, mix, and apply to your pinkies. Once your nails are dry, repeat steps 2 to 6. The change in my nails is so subtle that you have to look carefully to see it, whereas the ombre is far more obvious on my daughter’s nails. Whether you opt for a subtle ombre manicure or a more dramatic one, this is a lovely way to freshen up your look for spring.